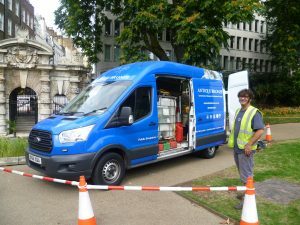 I went back on Friday and, quite by chance, John Connelly and William Bower from Antique Bronze were just finishing the garden’s statues and monuments’ annual clean with the York Watergate. ‘Those lions on top were green this morning,’ said John. 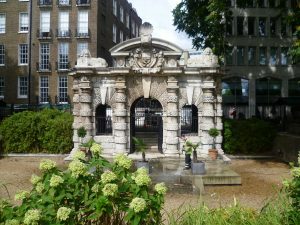 The York Watergate is the oldest monument in the garden, dating from 1626, and the worn limestone needs special care. He added, ‘All the statues in the garden are nice and shiny now.’ I was looking forward to seeing them for myself. 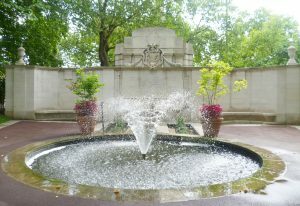 But first, a bit about Victoria Embankment Garden. 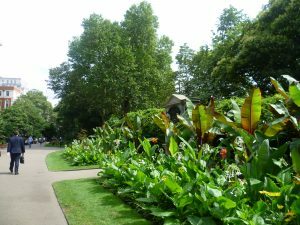 The garden owes its existence to the building of the Circle and District lines and the creation of the Embankment in the 1860s; together with Joseph Bazalgette’s construction of London’s main sewer. There was a sliver of land left – a long, thin isosceles triangle with its short end by the exit to Embankment Underground station – which, Parliament decided, should be a public garden. The poetic genius of my country found me at the plough and threw her inspiring mantle over me. She bade me sing the loves, the joys, the rural scenes and rural pleasures of my native soil in my native tongue; I tuned my wild, artless notes as she inspired. It doesn’t say who put up the statue, or why, or when; perhaps some homesick Scottish admirers. Nearby stands the Imperial Camel Corps Memorial – a slightly incongruous sight, or so I thought at first. This was a British army brigade operating from 1916-18 as part of the Egyptian Expeditionary Force during the First World War. It comprised over 4000 men and 4800 camels and was active on a number of fronts. Camels were well suited to a desert terrain and they were steadier in battle than horses. Furthermore, they were useful in carrying arms and equipment. 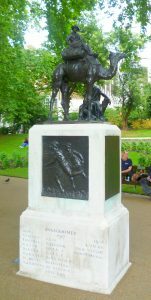 The wording on the plinth states: To the glorious and immortal memory of the officers, NCO’s and men of the Imperial Camel Corps: British, Australian, New Zealand, Indian, who fell in action or died of wounds and disease in Egypt, Sinai and Palestine 1916 1917 1918. It then lists their seventeen battle engagements. Every single man who died is named on the plinth – all 246 of them. The general impression is that they were very much a band of brothers. Even now, a hundred years later, this modest-sized memorial still stirs the heart. 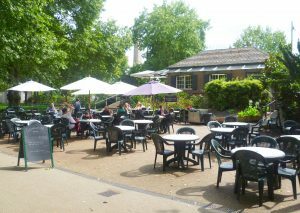 The embankment café is popular and, from the number of people sitting on the benches and walking through the gardens, the garden is obviously well-used and appreciated. For a start, he was obviously so posh that he didn’t need a Christian name. Could he have been part of Kipling’s Great Game somewhere on the North-West Frontier. I wondered. Whatever it was, it was plainly important. So I looked him up in the Concise Dictionary of National Biography. This is what it said: Eaton, Herbert Francis, third Baron Cheylesmore (1848-1925). Major-general; joined Grenadier Guards, 1867; retired as major-general without having seen active service, 1899; succeeded his brother, William Eaton, 1902; chairman, National Rifle Association, when Bisley became best shooting centre in the Empire, 1903-25; engaged in multifarious philanthropic works; collected military medals; KCMG, 1919. The bathetic tone of the above couldn’t be more different. It didn’t sound like the same man. Interesting. There are personal tributes, too. 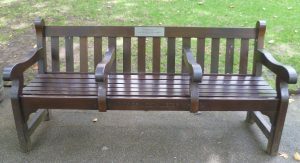 The bench above is In loving memory of Terry Greer who took pride in these gardens 1968-2006. Perhaps he worked here. He died far too young. Sir Wilfrid Lawson turned out to be surprisingly interesting. He was a typical morally earnest Victorian reformer; his friends commented on ‘his splendid leadership and his pure and unworldly life,’ (which, to a modern ear, raises a couple of awkward questions about his psycho-pathology). As a political Radical, he supported a number of worthy causes. He was an anti-imperialist; a supporter of women’s suffrage and of a number of Temperance societies. He was content to be in the minority fighting for what he believed to be right – and he was plainly ahead of his time in the causes he espoused. 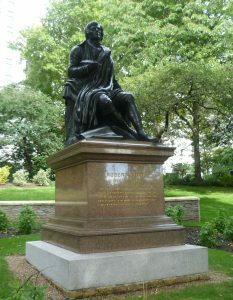 Sir Wilfrid’s statue was unveiled in 1909 by the Prime Minister, Herbert Asquith – amid continuous interruptions by suffragettes. They had lost a friend in Wilfrid Lawson and, as Asquith was not a supporter of Votes for Women, they probably resented his presence. Henry Fawcett was the husband of Dame Millicent Fawcett, leader of the Women’s Suffrage Movement – she was a suffragist, not a suffragette, and did not support violence. Her husband, who was a Liberal MP, a Professor of Political Economy at Cambridge, and postmaster-general under Gladstone, was a great support to his wife and encouraged her own career as a writer on Women’s Suffrage. He was blinded in a shooting accident aged 25. 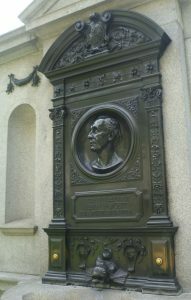 The simple legend under the bronze plaque reads: Erected to the memory of Henry Fawcett by his grateful countrywomen. He died too early to have helped the suffrage movement much. However, he did set up the first Post Office Savings bank which enabled the poor to save. I like this bronze plaque for its simplicity. It looks as though the warden’s hut was also affected by the Great Storm of 1987! 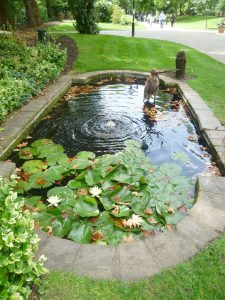 Mr Alfred Buxton, Chairman of the London County Council 1916-18, presented this charming lily pond to the Victoria Embankment Garden in 1915. I have no idea why. 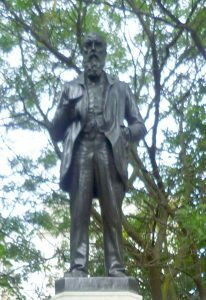 I rather like this elegant statue, set up in 1880, of the educational philanthropist, Robert Raikes, who is (misleadingly) credited with the foundation of Sunday Schools. He was appalled by the sight of so many destitute children taking to vice in his native town, Gloucester, and decided to do something about it. He felt strongly that education was the answer. After several attempts to teach grown prisoners to read and write – which didn’t work – he founded a Sunday School as a way of getting poor children, girls as well as boys, off the streets and teaching them to read and write, using the Bible as his teaching tool. His aim was to turn them into good and useful citizens. The results were very encouraging and Sunday Schools were soon set up in other towns and cities. 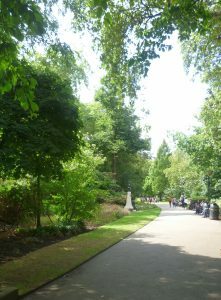 You can just see the top of the Henry Fawcett memorial poking out from the trees on the right. Is life a boon? /If so, it must befall /That Death, whene’er he call /Must call too soon. The bust on top of the obelisk is that of Sir Arthur Sullivan, composer, especially of the Gilbert & Sullivan comic operas; he was also a choirmaster, Professor of Composition at the Royal Academy of Music, and he held many other positions as well. I can’t help feeling that overwork probably contributed to his death at only 58. The verse comes from his comic opera The Yeoman of the Guard. You can see the music and the words on the open score. There is also the mask of comedy, a spray of laurel to signify his artistic achievements, and a mandolin. The whole thing is surely over the top – and yet… As I looked at it, I could feel the emotion. Sullivan’s untimely death must have been a huge blow to his admirers. He is buried in St Paul’s Cathedral which signifies how much his work was loved and how greatly he was esteemed. 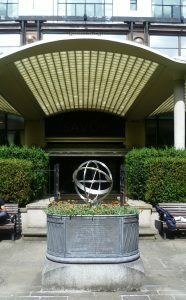 On the north side of the garden is the Savoy Theatre and the Savoy Theatre where the D’Oyly Carte Company performed the work of W. S. Gilbert and Arthur Sullivan. 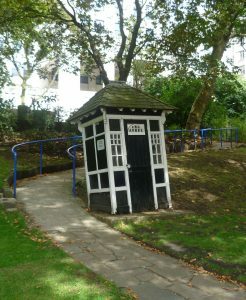 There is another memorial sited in a small enclosed space which is both part of Victoria Embankment Garden but also slightly separate from it. You can’t read it in the photo, but the black glass under the awning says Savoy Hotel. 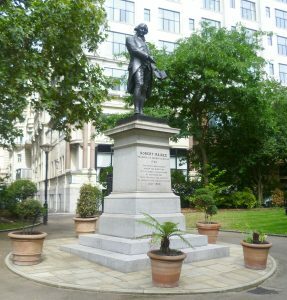 The writing on the memorial reads: To honour Richard D’Oyly Carte / Proprietor of the Savoy Theatre / Founder and owner of the Savoy Hotel 1889-1901 /This garden was given to London in celebration of his centenary. 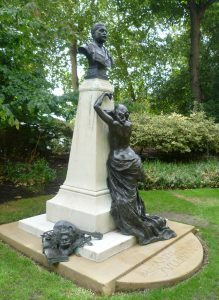 It is fitting that it is not far from the memorial to Sir Arthur Sullivan. The gate leads back to the Embankment and Somerset House. The garden itself is not big – you could easily walk its length in five minutes – but it’s well worth a visit. And it’s lovely to see the garden when the statues and memorials have been newly cleaned. 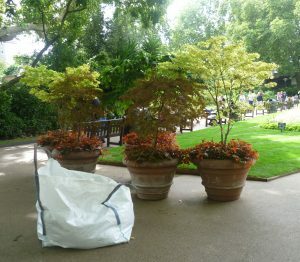 5 Responses to Victoria Embankment Garden: quirky or what? Edifying as always, EH. If I ever get to London again, reviewing your blogs as preparation will be essential. 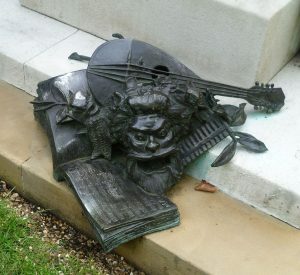 That is a mandolin on Sullivan’s plinth base, identified by the four courses (of two strings each) and eight tuning knobs. But why a mandolin? Could it be acknowledgement of Sir Arthur’s distaff Italian heritage? Or a reference to “The Gondoliers?” In addition to the elements you mentioned, I believe I see a pan pipe betwixt the mask, mandolin, and laurel. Thank you for your comment, Steve – and for correcting me about the mandolin. You could be right about the pan pipes; when I have a moment, I’ll check my ‘Savoy Operas’ and see if the instruments used are mentioned in ‘The Yeoman of the Guard’. Later: There are no specific instruments mentioned in the stage directions, so I think the mandolin and pan pipes are there to represent music, in general, and to stand for Sullivan’s contribution as composer of the G & S operas. I look forward to your research. I am not very knowledgeable about the works of Gilbert and Sullivan. Fascinating…such an interesting mixture of statues, plaques and memorials. Thanks for going back during a warmer time period to view them. Lucky you to go on THE day everything had been cleaned! Thank you for dropping by, Vikki. I suppose most public gardens probably have a fair number of statues, memorials, etc., but I think that the Victoria Embankment Gardens being so small made them much more visible! And it was great to see all the statues gleaming in the sunlight.